Take screenshots within a browser while testing - Firefox, Safari, Chrome and Edge a very useful feature that will help users. We have discussed Taking screenshots using selenium automation. But there may be number of reasons that you might want to take a screenshot of the web page in your browser. When ever there are any changes in the application or enhancements or patches or configuration changes or upgrades. Founded in 1982, Integra is a leading provider of innovative high technology products and solutions in the Government, BFSI and Telecom space, and is focused on the Indian and African markets. It is headquartered in Bangalore and has offices in all major cities of India. It will have two questions and Attempting One question is Mandatory. 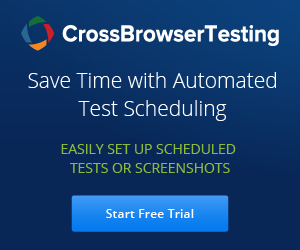 Testing is done when the build/application is ready to test and deployed in the test servers / environments. This is an adhoc kind of testing to cross check and make sure the functionalities which are important in the application are working as expected without throwing any server errors or exception errors. This is a kind of check on developers to make sure they do unit testing from their side when releasing the build to testing. The first five steps use verification as the primary means to assess the correctness of the interim development deliverables. Verification ensures that the system (software, hardware and documentation) complies with an organization’s standards and processes, relying on review or non-executable methods. Static testing is performed on the software/requirement documentation. Dynamic testing is performed on the build that is coded.